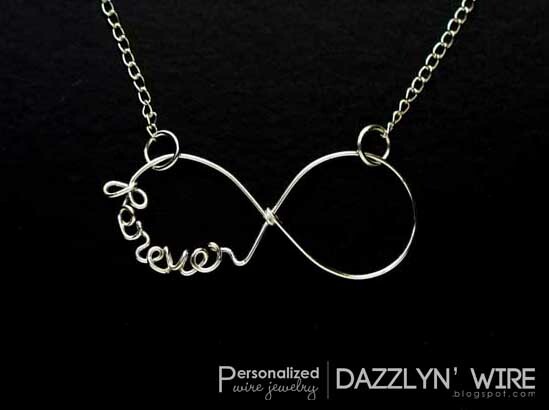 This customizable infinity wire name/word necklace is an original idea by Dazzlyn' Wire, where the idea came up when infinity symbols were trending but nobody made customizable names/word in the infinity symbol using wire. So that was how I started making it. And in fact, the 'forever' infinity necklace shown in the above picture was the very first infinity necklace that I made. I did a little online research to see if anyone already had the same idea but I can't seem to find any at all. It is the first to be published on the web as well as sold on Etsy, and it made it to one of Dazzlyn' Wire's top seller!